(VEN) - Growing foreign currency credit, increasing exchange rates between the Vietnamese dong and US dollar, and a higher trade deficit are expected to challenge the foreign exchange market in the remaining months of 2017. Although it has been controlled quite well since early 2017 despite strong pressure from domestic development demands, economists are forecasting that the exchange rate between the Vietnam dong and US dollar will probably increase slightly in the remaining months of this year. 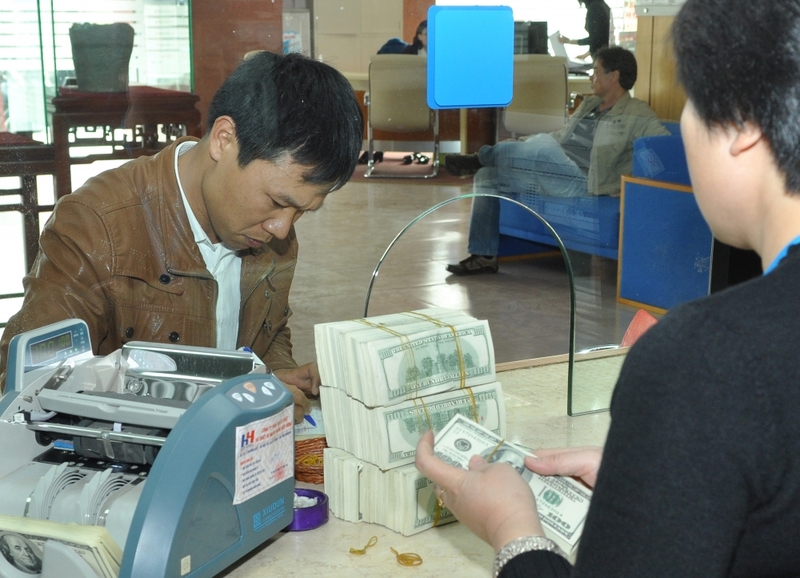 Since the start of this year, the USD/VND exchange rate hovered at around VND22,700 to the dollar. However, this period of calm is likely to end soon, as Vietnam enters its busy end-of-the-year business season. Growing foreign currency credit is one of the factors expected to challenge the foreign exchange market. A report by the National Financial Supervisory Commission showed that in the first eight months of this year, foreign currency credit accounted for 8.5 percent of all credit and grew 11.5 percent over late 2016, when growth reached 1.7 percent. It is mostly associated with commercial joint stock banks. A higher trade deficit and an expected increase of the US dollar value after a period of decline are also responsible for potential changes on the foreign exchange market. The fact that the World Bank (WB) and the Asian Development Bank (ADB) have tightened foreign currency-based official development assistance (ODA) since July 2017, and overseas Vietnamese remittances have decreased over the past two years, is also expected to affect the foreign exchange market from now to the yearend. Economists forecast medium pressure on the dong-dollar exchange rate in the remaining months of this year. The US dollar price has decreased in foreign markets, which is easing pressure on the exchange rate from now to the yearend. The exchange rate has been kept stable in commercial banks and on unofficial markets in recent months, with a slight downward trend. Economist Can Van Luc said the State Bank of Vietnam (SBV) is going the right way to keep the foreign exchange market stable. He predicted that the exchange rate would increase 1-2 percent in 2017, an acceptable growth level. The country’s foreign reserves reached US$42 billion as of late June 2017, the highest achieved by Vietnam. This is an important condition for maintaining foreign currency market stability. Regarding management of the foreign exchange market from now to year’s end, given possible scenarios for the US dollar in foreign markets, the National Financial Supervisory Commission said an additional schedule would be needed to adjust the central exchange rate in order to promote exports and avoid potential shocks as the US dollar price increases again. Deputy governor of the State Bank of Vietnam (SBV), Nguyen Thi Hong, said the SBV will continue working to keep foreign exchange rates stable and on a flexible basis to ensure and harmonize interests of importers and exporters, and the government’s and enterprises’ capital borrowing and payment relations. At the same time, the SBV will continue to consider and handle short-term foreign currency capital borrowing demands to serve production and trading activities, Hong added.